In a repeat of the hailstorms that devastated crops in parts of Maharashtra in March this year, several districts in western part of the state, including Marathwada region, experienced another bout of hail on Tuesday. Though the MeT department has called this phenomenon a pre-monsoon event, the intensity of the storm and the scale of damage caused to life and agricultural crops belie the mild interpretation. 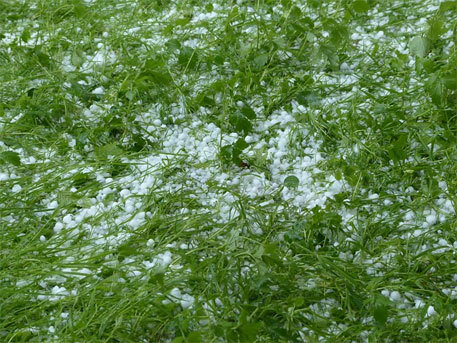 Nashik and Aurangabad districts are believed to have experienced maximum damage in the hailstorms that continued for about half an hour on the noon of May 27. According to early estimates by sources in the agriculture department, grape orchards in at least half of the Nashik taluka have been damaged. The vines, trimmed in preparation for the new season, were sprouting tender new coppices, which were battered by the heavy rain and hail. Farmers have reported that the new leaves sprouting on these vines were ripped by the hail, thus raising fears that orchards might not regenerate this year. Crops like watermelon and cucumber, which were ready for harvest, have also seen large scale damage. In Jalgaon district, which had earlier seen extensive damage during the March hailstorm, was battered by the hailstorm a day earlier, on May 26, causing damage to the district’s main orchard crop, banana. Proper estimates of damage are yet to be made, sources said. Apart from agricultural loss, two people are reported killed by lightening. In many area houses, lamp-posts and trees have been damaged due to storm and hail. According to Medha Kolhe, deputy director general, weather forecasting, at the Indian Metrology Department, Pune, moisture from Bay of Bengal is being drawn into the region due to a low pressure belt in Orissa and this is causing the irregular weather events. Calling the hailstorm phenomenon a ‘pre-monsoon’ one, she said that more rain and thunder can be expected in the Marathwada and Central Maharashtra regions in the next 48 hours. The easterm part of Maharashtra, including Vidarbha, could expect a heat-wave. “High local temperatures were also responsible for this unexpected weather phenomenon,” added the weather expert.